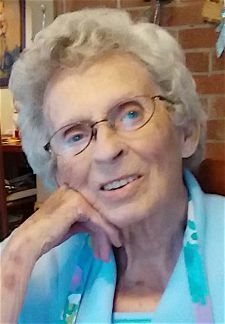 Hilda Elizabeth Sherron Heath, 92, passed away early Wednesday morning, January 23, 2019, at UNC-Rockingham Rehab and Nursing Center in Eden. A funeral service will be held at 2 PM on Friday, January 25, at Fair Funeral Home Chapel with burial to follow in Ridgeview Memorial Gardens. The family will receive friends one hour prior to the service (1 - 2 PM) at Fair Funeral Home and other times at the home of her daughter, at 129 Windy Road in Eden. For any friends that are unable to come during the visitation time, please feel free to come by, pay your respects and sign the register anytime Thursday afternoon or Friday morning. Mrs. Heath was born January 17, 1927 in the Leaksville section of Eden, NC to the late Henry Franklin Sherron and Nancy Katherine "Kate" Carter Sherron. She was a proud member of the 1944 graduating class of Leaksville High School. Mrs. Heath was a former member of Spray Primitive Baptist Church before their closing. Afterwards, she regularly attended Cascade Primitive Baptist Church. She was a former secretary for the Eden City Schools. Hilda enjoyed doing her crafts, painting, crocheting, knitting and, especially, enjoyed cooking for her family and friends. She is survived by her daughter, Sherron Smith and husband, Tommy, of Eden; grandson, Matthew Heath Smith of Eden; and several nieces and nephews. In addition to her parents, she was preceded in death by her husband, Kalen Heath; her sister, Helon Sherron Southern; and brother, Haynes Franklin Sherron. The family would like to offer their sincere thanks to Dr. Vyas, nurses and staff; to her extended family at Brookdale-Eden; and to Mrs. Heath's loving sitters, Linda Clodfelter, Pam Smith and Jessica White, for all their care and support. Memorial contributions may be made to Hospice of Rockingham County, PO Box 281, Wentworth, NC 27375 or to a charity of the donor's choice.